My sweet brother-in-law celebrated his birthday this past weekend. I thought I would share the card I made for him. 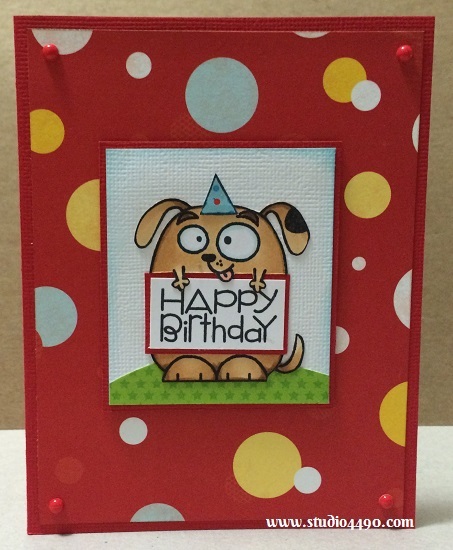 It’s a simple little card using Paper Smooches stamps. 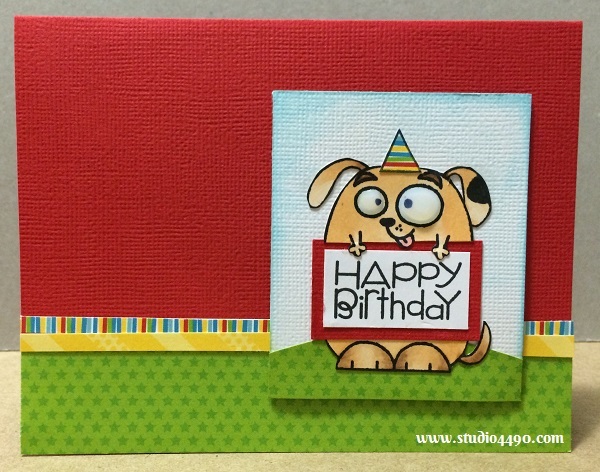 I love the Chubby Chums stamp set and it crossed my mind that the dog would look *adorable* if he were carrying a “happy birthday” sign. There was always the possibility that he might look a little odd but I decided to give it a go anyway and I have to say I *LOVE* this look. A few more ideas are now pinging through my brain (love this phrase, thanks Bev)! In fact, I am going to make another card right now using the same dog (as I have prepared a few and they need to be used!). Materials used: Stamps – Chubby Chums, Hullabaloo, Party Posse (Paper Smooches); Cardstock – American Crafts; Designer Paper – 6×6 Paper Pad – Surprise! (BoBunny); Sugardot Stickers – Everyday Vintage (Prima); Copic Markers and Distress Ink. On the inside of the card, I attached a white panel and a border of matching patterned paper just to finish it off. Edited to add: Just finished another card. Yay me! lol If you think the eye of the little pooch looks a little odd, this is because the glossy accents hasn’t quite dried (can someone say impatient? lol) and was wanting to droop while it was standing up during the photography session. It has settled down now that it is lying flat. Materials used: Stamps – Chubby Chums, Hullabaloo, Party Posse (Paper Smooches); Cardstock – American Crafts; Designer Paper – 6×6 Paper Pad – Surprise! (BoBunny); Copic Markers, Distress Ink and Glossy Accents (Ranger). Oh Bev, you’ve so much going on so please don’t apologise. I feel so blessed that you would take the time to visit AND to comment as well. Thank you sooo much for the very kind words and big hugs to you! Gotta say your comment made me grin ALL over my face, C! Nothing wrong with loopy – all the best people are! 😉 Thank you sooo much for your super sweet words, C! hugs!! Oh, I’m glad you liked it. Thank you. 🙂 It’s such a cute paper set, isn’t it? Can’t wait to see what you do as I know it will be AMAZING! 🙂 Thanks, Savannah! I was so chuffed with how it turned out. 🙂 He did have a lovely day, thank you! Hope your Travis did too. I often stop by your blog but I apologise that I don’t often leave a comment. I am going to try and remedy that as I know how much I appreciate when people comment here. 🙂 Thanks, Savannah! Have a wonderful day!